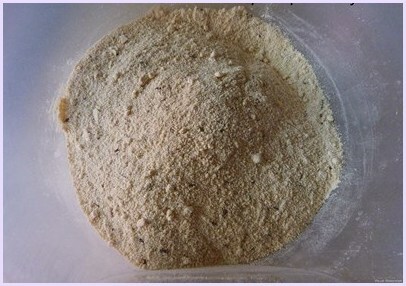 Dudhi muthia recipe (Muthiya) – This is one of the popular Gujarati snack. This is healthy snack because it steamed not fried. 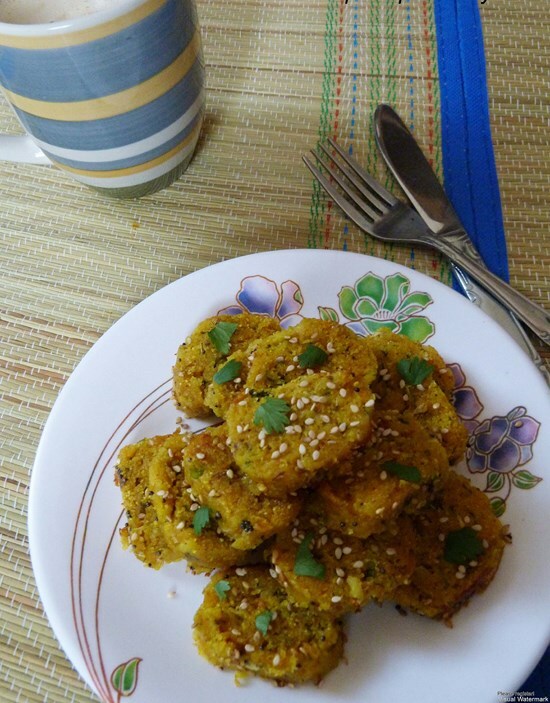 Steamed dudhi muthia is sautéed in oil with mustard seeds and sesame seeds. And that’s why they get little crispy, brown layer around the outside. 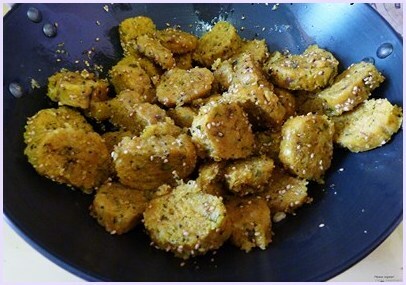 Sesame seeds give nice crunch and nutty taste to it. There are many different variation to the muthia. But this one made with lauki is the traditional one. Others are methi muthia, palak-methi muthia, mooli muthia and so on. 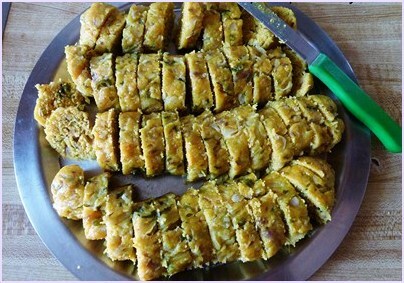 There are two methods of making muthia – one is steaming and second is deep frying. 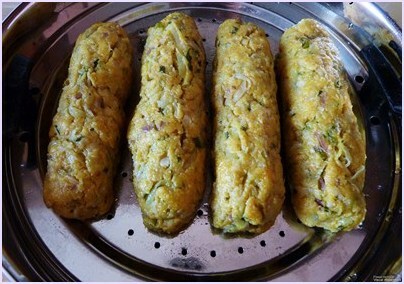 Usually steamed version usually is eaten as a snack with chutney or a cup of tea. While fried version is added in curry/sabzi e.g. Undhiyu, tameta muthia nu shaak, vatana muthia nu shaak, valor muthia nu shaak. It is very healthy and filling snack. You can pack this into kid’s lunch box also. It tastes good if it is cold. So this is best snack to pack for picnic, take one ketchup bottle with it. And you will have healthy, yummy snack. It is obviously much better than having a bag of chips. 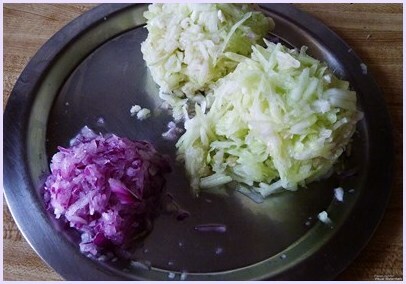 1) Grate onion and bottle gourd. Measure it and keep it aside. 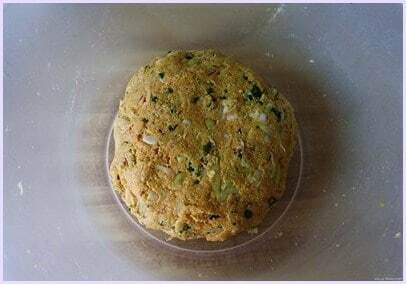 2) Then in a bowl mix wheat flour, besan, semolina, turmeric powder, asafoetida, baking soda, cumin seeds, fennel seeds, salt and sugar. 3) Then add ginger paste, green chilies, chopped cilantro, lemon juice and oil. 4) Then squeeze out as much possible water from bottle gourd and onion. Use your all strength to squeeze out water. Add it to the bowl. Mix well. 5) And knead it into soft dough. Use water if needed. You may need tablespoon or more or less or no water, depending on your lauki. 6) Prepare steamer. Add about an inch of water and let it come to a boil. Then apply some oil on steamer tray with holes in it and grease it well and keep it aside. 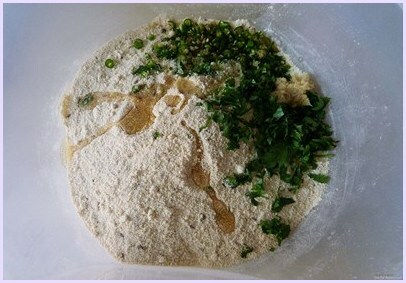 7) Apply some oil on your palms and divide the dough into four equal portions. 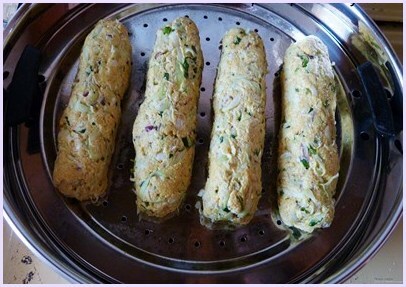 Shape each portion into cylindrical roll approximately 5 inches long and 1 inch in diameter. Arrange on greased tray as shown below. 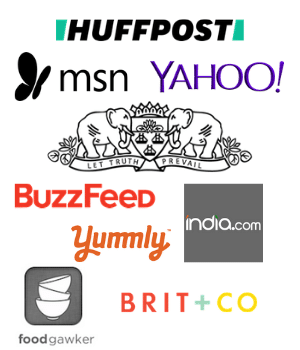 8) Steam it for 20-22 minutes. You can check muthia is done by inserting a toothpick or knife in the muthia and it should come out clean. 9) Let it cool for 5 minutes, remove it to plate or cutting board. then cut into half inch slices. 10) Heat the oil in a pan on medium for tempering. Once hot add mustard seeds and sesame seeds. Let them splutter. 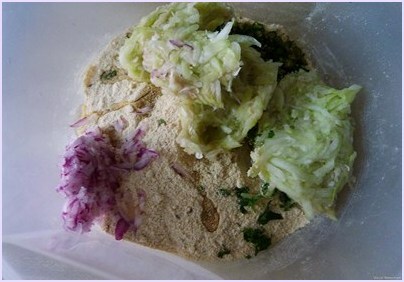 11) Then add sliced muthia. Mix gently so they do not break and sauté till you get little brown and slightly crispy around the edges. Turn off the heat. Serve hot. Serving suggestion: Serve as a snack with ketchup or chutney. It tastes best when served with mango chunda. It can be served with a cup of tea or coffee as an afternoon snack or morning breakfast. If you are travelling or going for picnic then this is best snack to pack into the box as it tastes good even if it’s cold. Grate onion and bottle gourd. Measure it and keep it aside. Then in a bowl mix wheat flour, besan, semolina, turmeric powder, asafoetida, baking soda, cumin seeds, fennel seeds, salt and sugar. Then add ginger paste, green chilies, chopped cilantro, lemon juice and oil. Then squeeze out as much possible water from bottle gourd and onion. Use your all strength to squeeze out water. Add it to the bowl. Mix well. And knead it into soft dough. Use water if needed. Prepare steamer. Add about an inch of water and let it come to a boil. Then apply some oil on steamer tray with holes in it and grease it well and keep it aside. Apply some oil on your palms and divide the dough into four equal portions. Shape each portion into cylindrical roll approximately 5 inches long and 1 inch in diameter. Arrange on greased tray as shown below. Steam it for 20-22 minutes. Let it cool for 5 minutes, remove it to plate or cutting board. then cut into half inch slices. Heat the oil in a pan on medium for tempering. 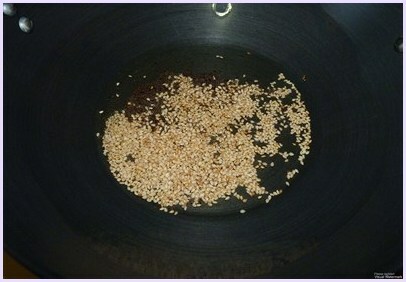 Once hot add mustard seeds and sesame seeds. Let them splutter. Then add sliced muthia. Mix gently so they do not break and sauté till you get little brown and slightly crispy.